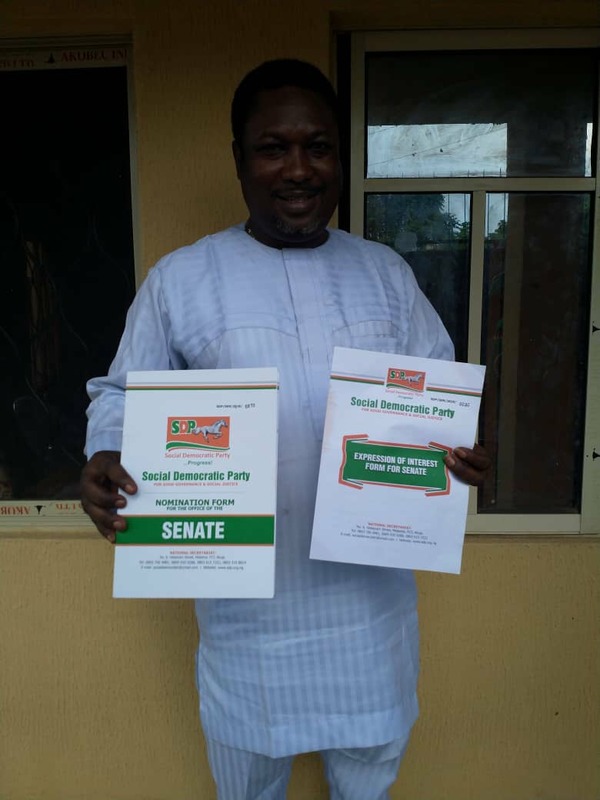 An aspirant to the Osun Central Senatorial District in 2019, Otunba Ayotunde Solomon Babatunde has picked his nomination and interest form at the headquarters of the Social Democratic Party. He made this known to our correspondent during a chat. Babatunde, an advocate for decisive change and action to restore the political, economical, military and social landscape and dominance of the Federal Republic of Nigeria is a global leader who was born over 45 years ago to the Family of Late Hon. Funsho Aremu Babatunde in OKE-AYAN compound of Inisa in Odo-Otin Local government area of Osun-State and had his early education at St Peter Primary School, and later at Inisa grammar school before moving to higher institutions outside the state has collected the Social Democratic Party Senatorial nomination and interest form to contest the 2019 Senatorial election. Otunba, as is popularly called after receiving the form from his staff, Mr Olabisi Omotosho who picked it up for him at the National Headquarter, Social Democratic Party-SDP Abuja revealed he is into the race for the betterment of his constituents. He emphasized the need for capable and passionate people at the helms of affairs especially the legislative arm of Governance for effective checks and balances on the executives. He believes that with the support, encouragement and cooperation he has received so far from the party members within the zone and the zeal to re-arrange the political and socio-economic terrain of this country by electorates, he will deliver at the poll. Part of his profile available to press reveals he is well-respected for political judgments, integrity, ethical behavior, passion and commitment to Osun state and Nigeria citizens as a whole. 1996-Secretary Caretaker committee, Student union Government Ahmadu Bello University, Zaria. *1999 – 2000 -President Drug Free Club, University of Ilorin, Kwara State. *2000 – Member Adisa Leadership Forum, Ilorin Kwara State. 2002 –Welfare Officer II, National Association of Nigeria Students, Zone C.
2002-2003 –PA to Special Assistance to Kwara State Governor on Mobilization. 2004- State coordinator Oduduwa Youth Progressive movement, Osun State. 2006 – Leader, People’s Democratic Party Youth Forum, Osun State. Ayotunde Babatunde is the Chairman, ECLIPSEWAVES TECHNOLOGIES Ltd, a global telecommunication company with its head office in Lagos, Nigeria. He is happily married to Adebola and the marriage is blessed with children.